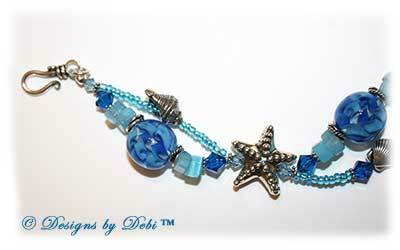 I love to design beachy summer pieces so here's another one! I began this one with some intriguing artisan lampwork beads handmade by Bill Grout of Aspen Hot Glass Studio in Corvallis, MT. 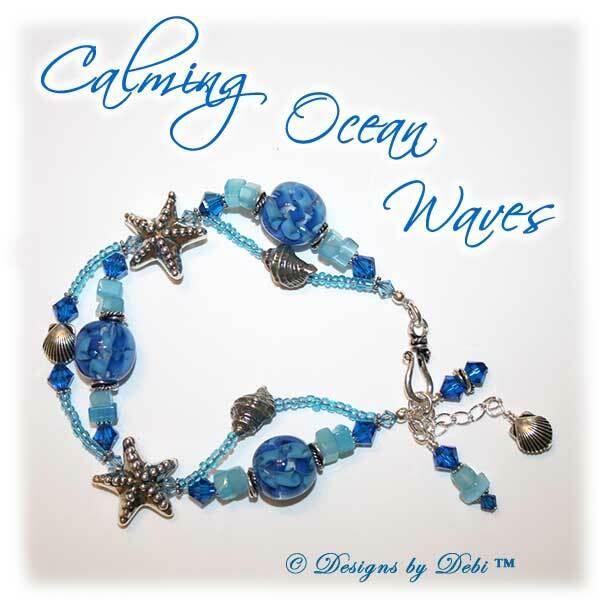 These round beads with their ribbons of light and dark blue remind me of waves rolling onto the shore. I surrounded his beads with light blue cat's eye chips to look like sea glass and used coordinating Swarovski crystal bicones in capri blue and aquamarine. 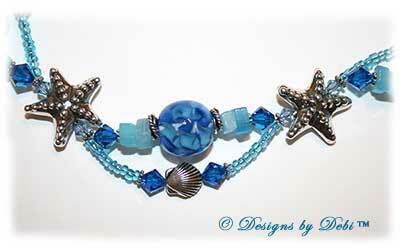 The two other main beads in the piece are Thai Hill Tribe silver starfish, handmade by silversmiths in Thailand. Sterling silver conch shells and TierraCast silver scallop shells continue the beach theme, woven in waves along with tiny aqua seed beads. You'll find Bali silver spacers throughout the piece and it is finished with a Bali Silver Hook and Eye Clasp. I added a 1 inch sterling silver extender chain for you to adjust the fit. 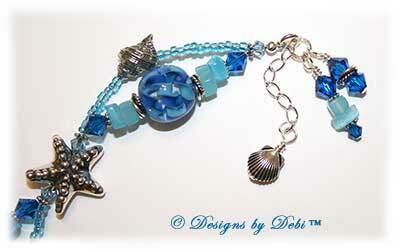 A shell bead hangs at the end of the chain and there are 2 more dangles hanging along as well. April 24th his life was forever changed when he was walking home from the L'il General Store and a 16 year old boy snuck up behind him and stabbed him in the back for no apparent reason. This 74 year old man who had been the picture of health was, in a split second, left a paraplegic, confined to a wheelchair in excrutiating pain. The slightest touch to his legs feels like an intense blow because the nerves in his legs are in a constant state of high alert; his spinal cord was severed so he cannot use his legs, but he hasn't lost all feeling in them. out-of-the-blue, senseless tragedy has left them with an overwhelming pile of medical bills; the initial hospital stay alone upwards of $50,000. The bracelet measures 10 1/2 inches end to end including the extender and will fit a 6 1/4 inch (very loosely, but secure) or larger wrist. If you need the bracelet re-sized, please let me know at time of purchase and this can be done prior to shipment at no additional charge.